1. The quantitative or qualitative evaluation of a substance for impurities, toxicity, or other characteristics; the results of such an evaluation. 2. To examine; to subject to analysis. 3. Test of purity; trial. /as·say/ (as´a) determination of the amount of a particular constituent of a mixture, or of the potency of a drug. microbiological assay assay by the use of microorganisms. microcytotoxicity assay one using the pattern of lysis of peripheral blood lymphocytes in the presence of complement and typing sera to type serologically defined HLA antigens (HLA-A, -B, and -C antigens). 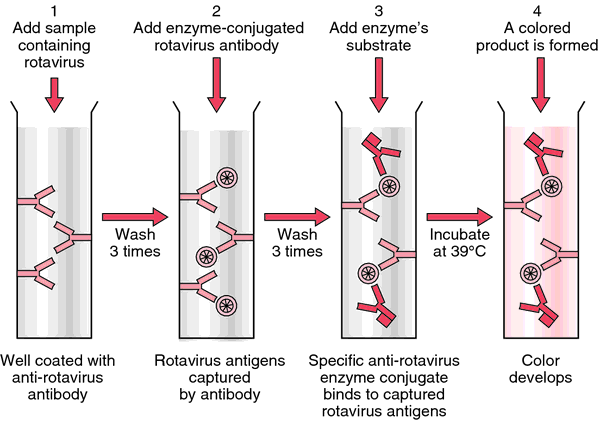 radioimmunoprecipitation assay (RIPA) immunoprecipitation conducted with radiolabeled antibody or antigen. radioligand assay any assay procedure that uses radioisotopic labeling and biologically specific binding of reagents. stem cell assay a measurement of the potency of antineoplastic drugs, based on their ability to retard the growth of cultures of human tumor cells. the analysis of the purity, effectiveness, or concentration of drugs and other biological substances, including laboratory and clinical observations. A quantitative or qualitative procedure for detecting the presence, estimating the concentration, and/or determining the biological activity* of a macromolecule (e.g., an antibody or antigen, molecule, ion, cell, pathogen, etc.). Assays are based on measurable parameters that allow differentiation between sample and control. Biological assays (not to be confused with animal testing for drug efficacy and safety) are of historic interest, as they are cumbersome, difficult to quantify and rarely provide information that is not obtainable by other testing formats. 1. To examine or analyze. 2. A test of the biologic potency of something (e.g., medicine). Qualitative or quantitative analysis of a substance such as a drug. An analysis of the chemical composition or strength of a substance. determination of the purity of a substance or the amount or activity of any particular constituent of a mixture. bioassay; determination of the potency of a drug or other substance by comparing the effects it has in a biological system with those of a reference standard.